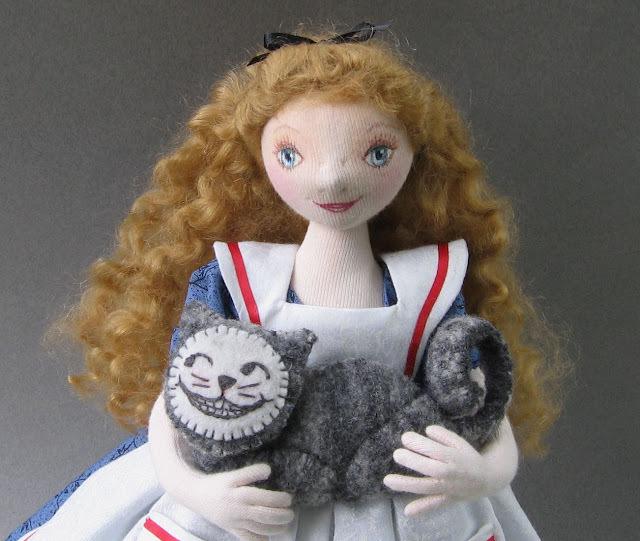 The Fairies Nest - OOAK Cloth Dolls & Fiber Fantasies: Alice at Last! Today is reveal day for the 2nd Annual ADO blog event...Hurray! 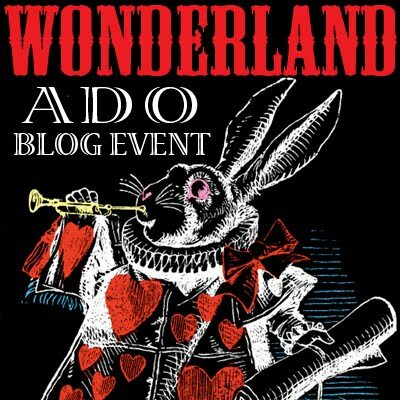 The challenge this year was to make a character from "Alice in Wonderland" and if you are a regular reader of my blog, you know what an Alice fan I am! This was a challenge I couldn't refuse. I did reveal a few WIP pictures of my Alice in earlier posts here and here , but now it's time to see the complete finished product... so Viola! 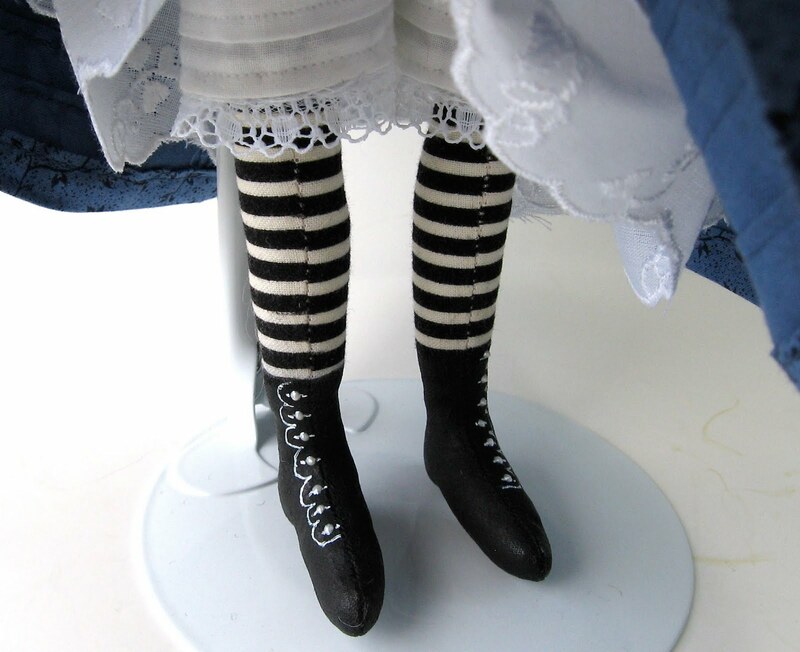 My Alice has cloth skin over cloth and wire armature, painted shoes, Lots of pintucks in her clothes, and mohair curls. Chessie is made from a felted sweater and has an embroidered face. 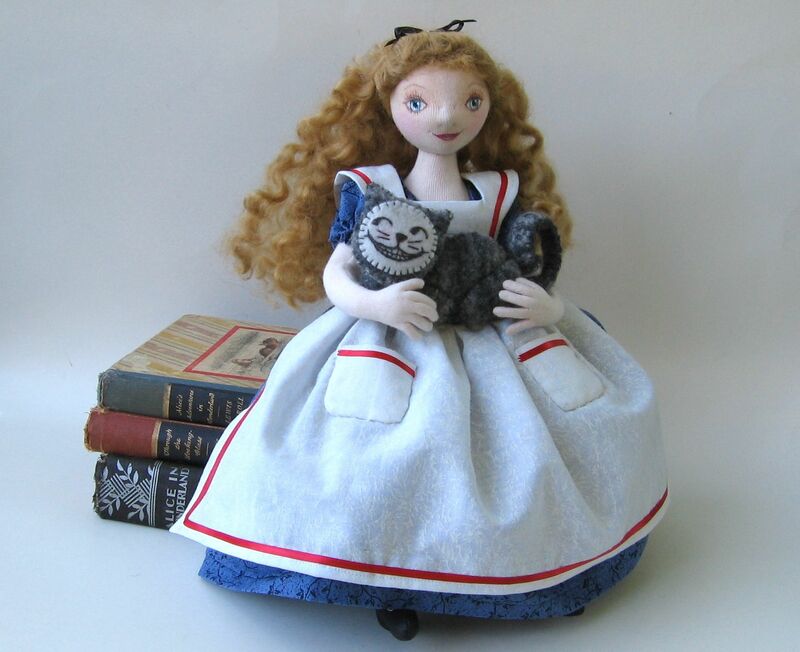 This Alice has been sold, but I'm planning a dark version later this month so keep watching to see how she progresses. I also have plans for a White Queen, but for the moment she's still "percolating" in my head. On July 9th you can click this link and find a list of participants in the blog challenge. Go take a peek at some of their wonderful dolls...you'll be amazed at what you find...just don't fall down a rabbit hole! wow she is perfect! Your attention to detail is astonishing. How long did she take you? I always love your creations, I will absolutely be looking forward to your darker alice. Good luck in the challenge! she is gorgeous and meticulously crafted. can't wait to see her dark side. Oh My Goodness she is Beautiful! You are amazing! oh she's very nice, all the detals are so perfect!! She is a darling,I love her sweet expression and that dress is so lovely,the cat is cool and lots of fun,nice work! She is absolutely adorable. I love her outfit and those boots are to die for! Great job on her! Have fun down the rabbit hole! Oh so awesome! The dress and all the details! I'll have to follow your blog now to see the dark version. You did a great job on Alice. Her stocking and boot details are really nice. This is such a nice doll. Your Alice is so sweet. Beautiful job! I love the stitching around the Cheshire cat's face...it really makes me think of the disappearing creature. She just has to be one of the sweetest dolls EVER!!!!!!!!!!!!!! She's so pretty- I love her Cheshire Cat! So cute! I love her boots and stockings! I love Alice! a cat is a plus!! what a wonderful doll. she is wonderful Cyn! so sweet and lovely. I really love her Cherise cat. Love those shoes . Great job. She's very cute and I'm also looking forward to the dark Alice. Oh my goodness - a Dark Alice and the White Queen!? Too excellent - I shall be keeping an eye out. I adore this Alice - and the expressions on both her face and the Cat's are just wonderful. Of course I love the texture of all you pieces - its just so inviting and delicate! Can I mention how excellent those shoes are? I love those shoes. Beautiful doll, even though she is "just a girl" she seems to have an other- world 'fairie' look to her. Oh, my daughter loves the cat. What a Beautiful Alice!!! You've made a Wonderful job on her...I love everything...and the dress is fantastic!!! She is amazing, every part right down to the shoes, and I love that cat! Very sweet doll. Great detail on the boots. What a sweet almost angelic little Alice and I agree, such attention to detail! Thank you for visiting my Alice earlier today. Loves yours too!You definitely can sew!!! (I'm pretty hopeless at that). 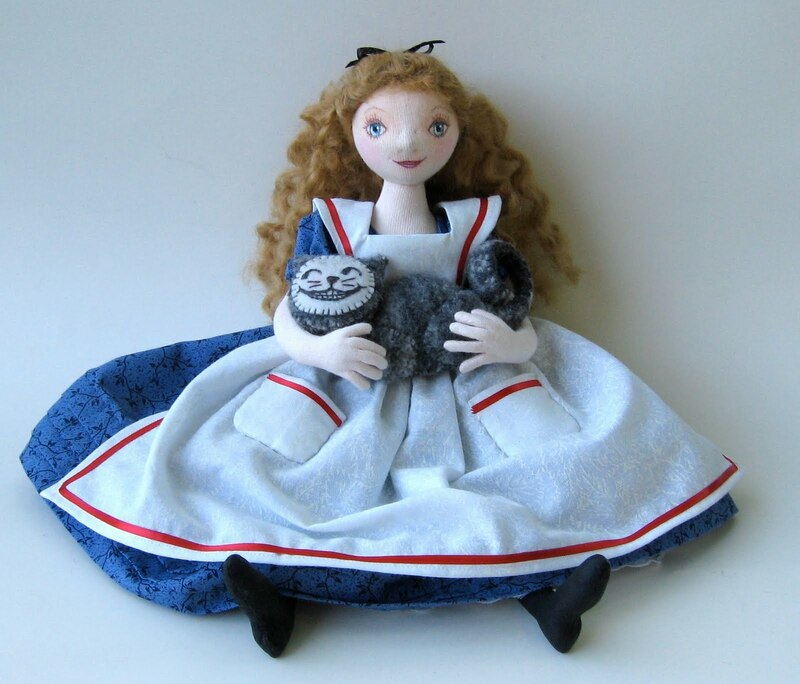 Brilliant Alice... so detailed! She's perfect, and that cat is to die for. KUDOS! I just love her! But I love all your work. I would so love to see a Mad Hatter Doll, one the right size for my ever growing doll tea party! Hint, Hint, wink, wink!!! Amazing attention to detail - she is gorgeous!! So lovely! i love cheshire too! great job as always,, can't wait to see the dark version! Your Alice and kitty are just lovely. And I must be honest I am totally jealous of your finger turning ability!! LOL They are perfect! WOW I really admire artist who are so good with needle! she is over the top. Your work just has a real shine of perfection to it! 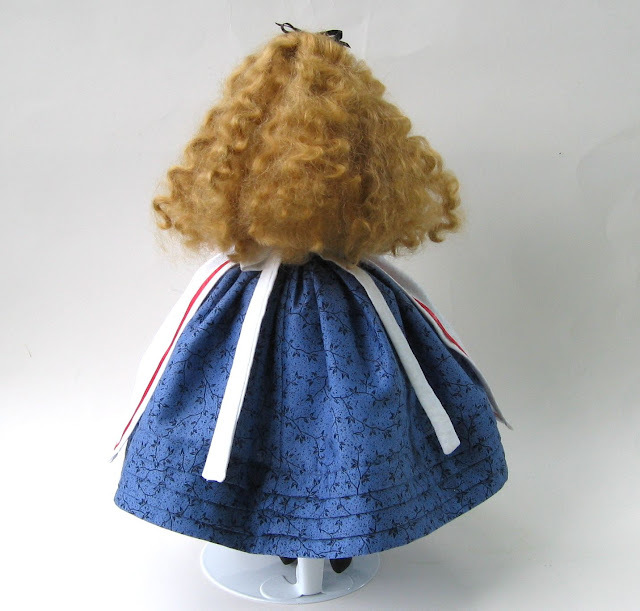 lots of work in this doll - and how did you get every stripe to match!! WOW! I love her, and the Cheshire cat has such a perfect expression! She is A M A Z I N G !!! I can't wait to see you make the queen! I'd also love to see some of the soldiers! She si wonderful, especially love her red ahir & those boots! cant wait to see the dark version. I don't have words for how much I love this alice. Soooooooo cute! I love love love love love your work!! !